Emergency evacuation plans are what should be developed in order to ensure the most efficient as well as the safest evacuation time of all expected residents of a city, region or structure. An "evacuation time" benchmark for different conditions and hazards is established. Such benchmarks can be established by using regulations, simulations (e.g., modeling the flow of people in a building) and best practices for determining the benchmark. The proper planning is what uses at least a few exits, the so-called “contra-flow lanes” as well as the special technologies in order to ensure fast, complete and full evacuation. It is also important to consider for personal situations as they may affect some individual's ability to evacuate. It may include the alarm signals with both visual and aural alerts and all the needed evacuation equipment (e.g., pads, sleds and chairs for disabled people). In order to create the right building fire and emergency plans, the regulations such as building codes can be also used so it can reduce the possibility of panic. In this way, it may allow the individuals to process the need to self-evacuate having no causing alarm. The right planning can implement a so-called “all-hazards approach” meaning that the plans can be reused for the other hazards that can appear. Any emergency planning should be focused on preventing the emergencies from occurring as failing that it may be possible to develop a good action plan for mitigating the effects as well as the results of any emergencies. In order to reduce or to avoid the significant losses to a business, emergency managers should be focused on identifying and anticipating the potential risks in order to reduce their probability of occurring. Following a common process to anticipate, assess, prevent, prepare, respond and recover from an incident, emergency managers can use ConceptDraw DIAGRAM for making the professionally looking building plans as well as the fire and emergency plans. Fire and Emergency Plans solution was developed by the team of IT specialists of CS Odessa in order to provide all ConceptDraw DIAGRAM users with most common tools that might be needed for creating both Fire and Emergency Plans. Apart from the emergency managers, the Fire and Emergency Plans solution can be also used by electricians, interior designers, telecommunications managers, builders and other technicians. 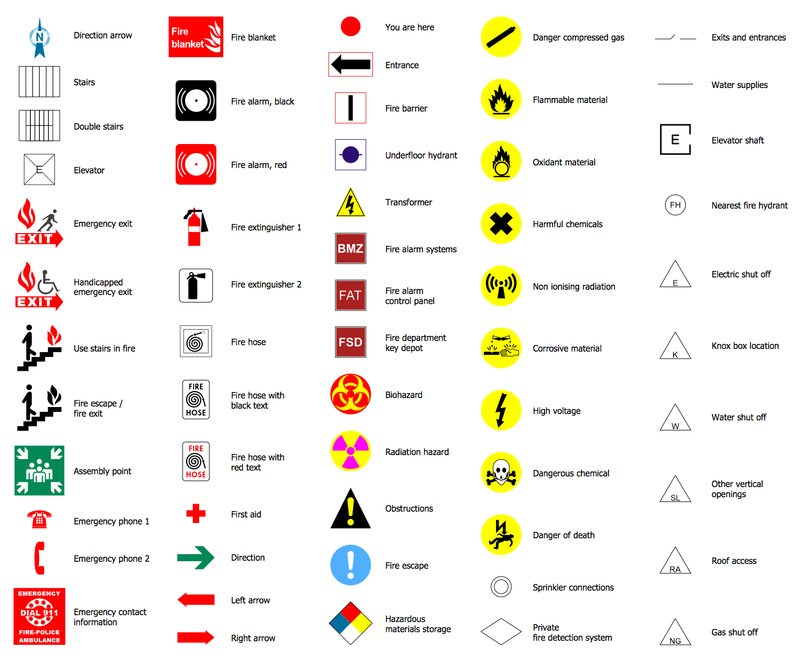 There are 3 stencil libraries containing 75 vector objects in the Fire and Emergency Planning solution. There are a few samples that you see on this page which were created in the ConceptDraw DIAGRAM application by using the Fire and Emergency Plans solution. Some of the solution's capabilities as well as the professional results which you can achieve are all demonstrated here on this page. All source documents are vector graphic documents which are always available for modifying, reviewing and/or converting to many different formats, such as MS PowerPoint, PDF file, MS Visio, and many other graphic ones from the ConceptDraw Solution Park or ConceptDraw STORE. The Fire and Emergency Plans solution is available to all ConceptDraw DIAGRAM users to get installed and used while working in the ConceptDraw DIAGRAM diagramming and drawing software. 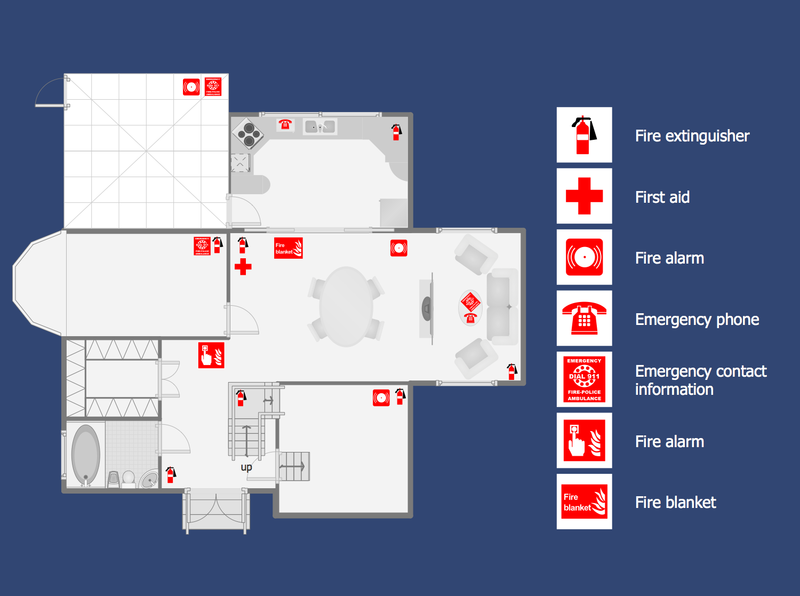 This diagram was created in ConceptDraw DIAGRAM using the combination of libraries from the “Fire and Emergency Plans” solution and “Floor Plans” solution. An experienced user spent 15 minutes creating this sample. This sample shows an evacuation plan from the premises of a large building. The emergency evacuation from a building is an immediate and urgent transfer of people in a case of hazard or threat, in cases of fire, storm, flood, earthquake, tornado, hurricane, explosion, or any other danger for human lives, property, and realty. The emergency evacuation plans are helpful at this, they ensure effective evacuation and help to realize it the safest way, assist people to find emergency exits as quick as possible and the rescues to orient in a given space, regardless of whether we are talking about evacuation from a large building or a small, office space or a residential house, or even from some open area. 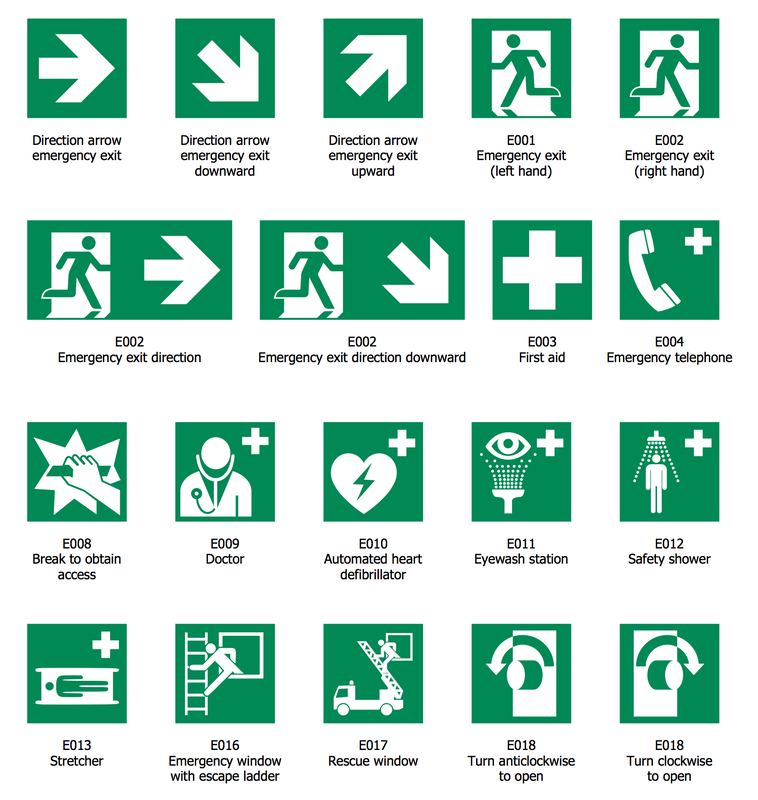 Directions to the emergency exit are visually displayed by the arrows colored in green on this evacuation plan. Location of fire extinguishers, first aid kits, telephones, electrical panels and other details is also marked on the plan. This office emergency plan example depicts the layout of firefighting equipment and scheme of evacuation ways. The thought-out fire protection and also protection from other emergencies, special fire-fighting equipment, fire emergency plans on the walls and fire exit signs are obligatory for the buildings of any type, especially for the office buildings, schools, kindergartens, universities, shopping centers and other places of accumulation large number of people. Besides, each of these buildings must be constructed in compliance with the building and fire codes. 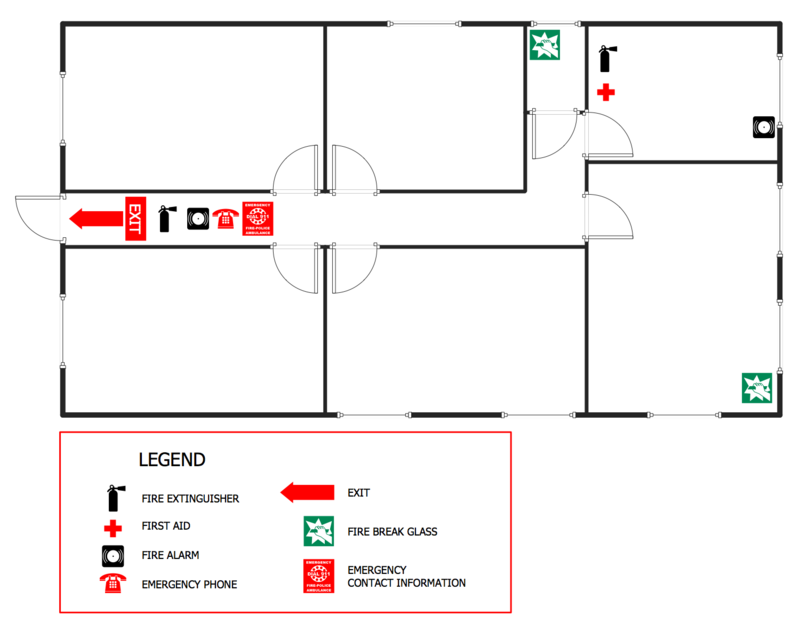 This emergency plan template was made using professionally designed elements of fire-fighting equipment, emergency, and other signs from the Fire and Emergency Planning library included to Fire and Emergency Plans solution, and is the best for using as the base designing your own fire escape floor plans and emergency plans. The legend you see here is the convenient way for explaining the meaning and significance of notations used on the current diagram. This sample diagram illustrates the fire emergency plan for an apartment. The fire safety measures for a residential building envisage obligatory implementation the certain fire safety requirements that must be fulfilled at the stage of building construction and its commissioning, as well as include the learning activities and placement of informational stands to inform inhabitances and visitors of this building about emergency exits and the rules of behavior in emergency situations. ConceptDraw DIAGRAM software gives you the excellent possibility to efficiently design the fire and emergency plans beginning with the design of building floor plans or using the ready floor plan templates offered by ConceptDraw STORE. 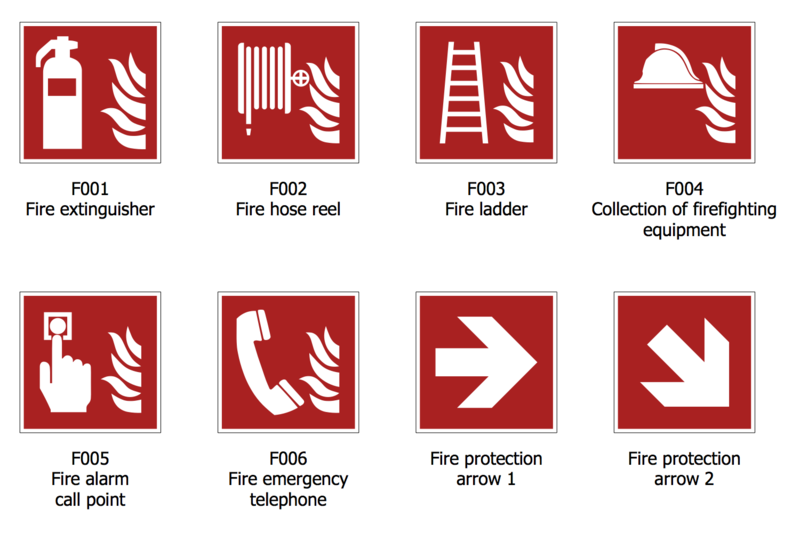 Having the ready floor plan and collection of predesigned fire and emergency signs and vector objects offered by the libraries of Fire and Emergency Plans solution, you can design your emergency and fire safety plans literally in minutes, simply dragging the needed signs on the floor plan and arranging in the desired way. This sample designed on the base of Wikimedia Commons file "FRP Musterplan" shows the escape and rescue route plan, or the fire protection plan constructed on a ground floor plan of a certain building. It includes the evacuation scheme and the relevant fire protection equipment, designates the places of its placement inside this building, as well as location of escape routes, and serves for visitors and staff of this building as an escape and rescue plan helping them in a case of fire or any other danger to leave this building by the fastest and safest way. This plan includes also an extensive legend explaining in details depicted fire protection scheme. As for the usage of this plan, any ConceptDraw DIAGRAM user can easily use it as a fire evacuation plan template for a quick start in drawing the fire protection and emergency plans, or simply as an example for own plans. This firefighting floor plan sample based on the Wikimedia Commons "FEP Geschossplan" file, illustrates detailed building floor plan and outlines on it the plan of fire protection. The firefighting is the set of actions directed on the rescue and protection lives, property and environment threatened of fire, on the prevention the fire spread and extinguishment the fire occurred in a building, on an open area, in a forest, in a car or anywhere else. The firefighting plans help in realization the firefighting actions, they are usually created for the staff located in a building at the moment of fire, for the teams of firefighters and rescue teams, and include the information not only about emergency exits location but also additional information about dangerous places within a building, about placement warning and informing signs and announcements. It’s a beautiful and professional looking emergency action plan template, which is available for use from ConceptDraw STORE. This sample shows escape and rescue plan template. It is made on the building floor plan and contains the clearly annotated fire safety points. The plan representing this building review on a defined open area, near other buildings and roads, is presented at the top left corner of the diagram. Another three frames you see on this diagram, depict the legend explaining special safety symbols used here, as well as the corresponding signs and rules of behavior in case of fire or accident. This plan is a vector graphic document, which can be printed or send to the colleagues by e-mail directly from the ConceptDraw DIAGRAM software in a few seconds. Designing with using templates, samples and pre-made vector design elements offered by numerous solutions of ConceptDraw Solution Park is a time saving and convenient way of drawing diagrams and plans of any type and complexity. Try to make sure this right now on the example of fire and emergency plans! This fire protection plan sample was designed with tools of Fire and Emergency Plans solution on the base of "FEP Übersichtsplan" file published on the Wikimedia Commons. The fire protection plan is a floor plan of a specific building or several closely located buildings, on which is depicted the scheme of placement of all relevant fire protection equipment and escape routes. These plans are indispensable during people's emergency evacuation from the buildings, in cases of fire or other threats to lives and property. Typically, as the fire protection equipment are used the fire alarms, fire and smoke detectors, emergency lights, signs leading to alternative escape paths - to emergency exits and fire escapes. Use the ConceptDraw DIAGRAM diagramming software to design the fire protection plans, fire emergency plans and fire rescue plans for technical objects, living houses, offices, malls and other buildings, and draw them easy even without having design abilities and special drawing skills. This sample represents an Escape and Rescue Plan for the premises of academic and research library of the University of Freiburg, designed on its floor plan. The sample is based on Wikimedia Commons file “Universitätsbibliothek Freiburg” and designed using exceptionally vector design objects offered by the libraries of ConceptDraw Solution Park, in particular, Floor Plans solution and Fire and Emergency Plans solution. Looking at this plan anyone immediately notices the extraordinary form of the building and accordingly the premises of this library. Additional information, as well as explanations for the special symbols and signs, used on this Escape and Rescue Plan are represented inside the frames. The world sides are also indicated on the diagram and allow you to instantly identify the building's location on a defined territory. With same ease, you can design the floor plan of Freiburg University and designate the scheme of evacuation on it, at this no matter which form will have this building because ConceptDraw's tools let you draw any you need. This fire evacuation plan example is an Escape and Rescue Route Floor Plan designed in ConceptDraw DIAGRAM diagramming and vector drawing software and having as the base a Wikimedia Commons file "FRP Musterplan". The generally accepted rules and measures of fire safety, as well as specially prepared and approved evacuation plans play one of the leading roles in saving people lives and property in case of some danger, fire, natural disaster or any other critical situation, and help in reducing destructions caused by these factors. On this escape and rescue route floor plan are designated the signs helping in evacuation people from a given building, are showed emergency exits, assembly points, and location of fire extinguishers. You can also see the warning announcements that it is not allowed to use lifts in case of fire, earthquake or other dangerous situations. The horizontal and vertical rescue routes differ in shades of green color on this plan. This Escape and Rescue Plan example demonstrates the fire protection scheme constructed in the ConceptDraw DIAGRAM software according to the DIN ISO 23601 standard. This plan lets one represent in a visual and simple form all building's escape and rescue routes that are lifesaving in cases of any accidents, fires, hazards, and emergencies. The simplicity, clearness, and strictness of similar plans allow orienting rapidly in extreme situations, receiving the information about emergency exits, routes to them, and places of location of the evacuation and firefighting equipment. Besides, in this sample, your current location in a given building is also marked, i.e. the place where you are now. It is convenient because it lets instantly determine where the nearest emergency exit is and allows evaluating the shortest path to it and so one can start moving in the right direction without any delay. Both ConceptDraw DIAGRAM diagramming and drawing software and the Fire and Emergency Plans solution can help creating the emergency plans you need. 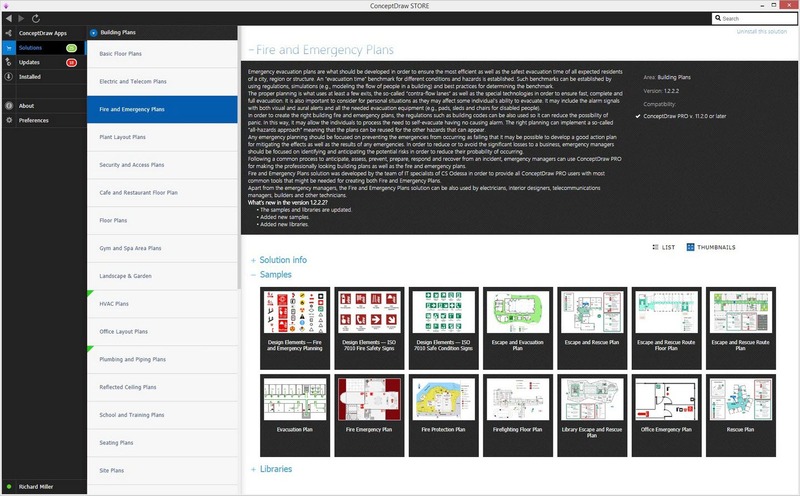 The Fire and Emergency Plans solution can be found in the Building Plans area of ConceptDraw STORE application that can be downloaded from this site. Make sure that both ConceptDraw DIAGRAM and ConceptDraw STORE applications are installed on your computer before you get started. 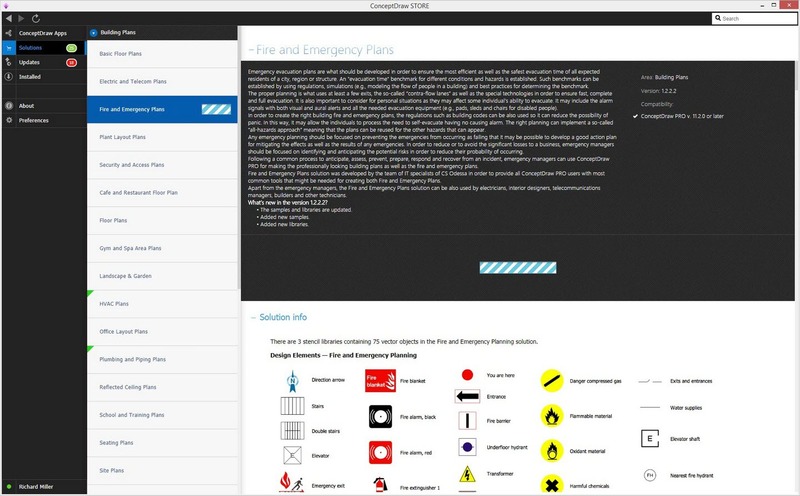 After ConceptDraw STORE and ConceptDraw DIAGRAM are downloaded and installed, you can install the Fire and Emergency Plans solution from the ConceptDraw STORE.